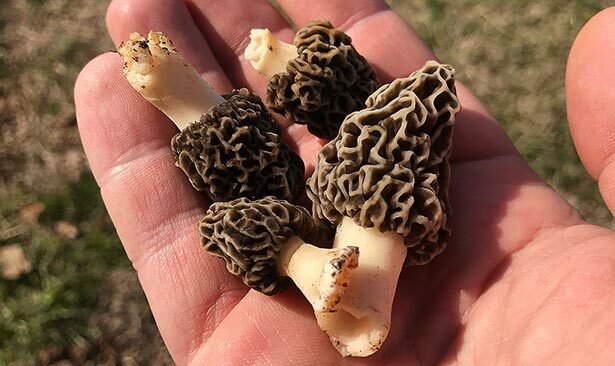 Fried, sautéed or simmered in a hearty stew, I haven’t found a recipe where I didn’t like wild morel mushrooms. But as a recipe developer, I’m constantly challenged to find different ways to utilize wild ingredients every year. This recipe was inspired by one of my good friends who once served Greek dolmades at a dinner party. 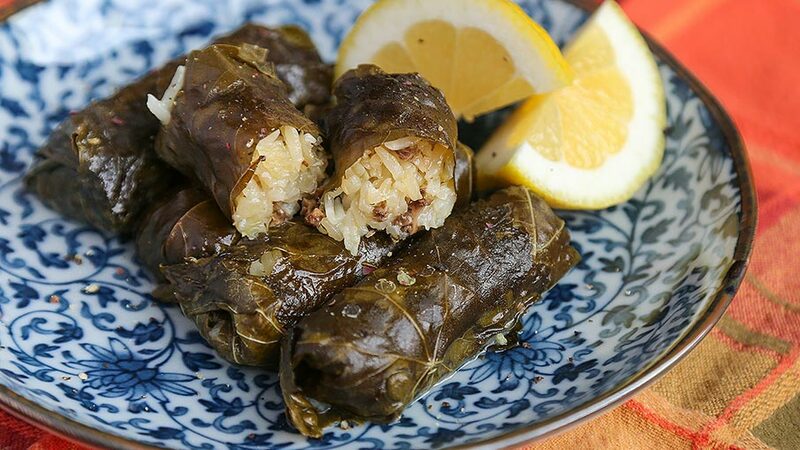 Her husband is Greek so these delicious morsels of tender rice, minced lamb, onion and herbs stuffed in grape leaves show up at their dinner table often. As an appetizer or side, dolmades are supposed to be served cold or at room temperature. This is a great dish if you need to begin preparing dinner the day before. When thinking of a new way to prepare morels, I thought of my friend’s dolmades dish and how morels, known for being rich and meaty, would make a great alternative to minced lamb. I was right. I made a large batch and they were gone by the next day. The morels added a savory, mushroom-y element to these little bites. The great thing about this dish is that you can fill them with whatever you want. Here’s my simple version of this dish. Heat ¼ cup of olive oil in a sauté pan. 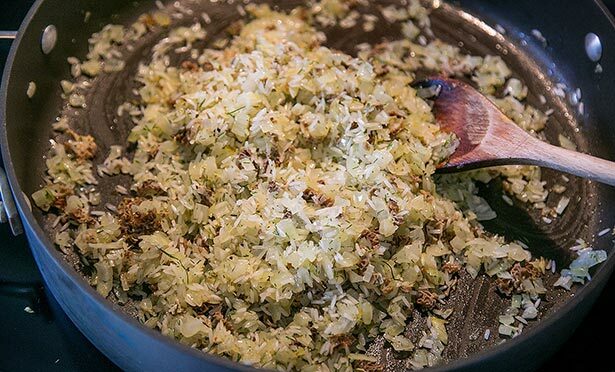 Cook onion and grated lemon zest until softened, about 10 minutes. Add morel mushrooms and sauté until cooked, 5-10 minutes. Next, add rice, dill, salt and pepper. Stir until rice is coated with oil, and then add in 1 cup of chicken broth (see note below). Simmer until rice has absorbed broth, stirring frequently. Scrape rice and mushroom mixture into a bowl and allow to cool. Note: If using dried morels, pour 1 cup of boiling water over 1/3 cup of dried morels and allow them to reconstitute for at least 30 minutes. Use the reconstituted morels the same way as fresh, reserving the mushroom liquid to use in step 1 instead of the chicken broth. If necessary, strain out grit. 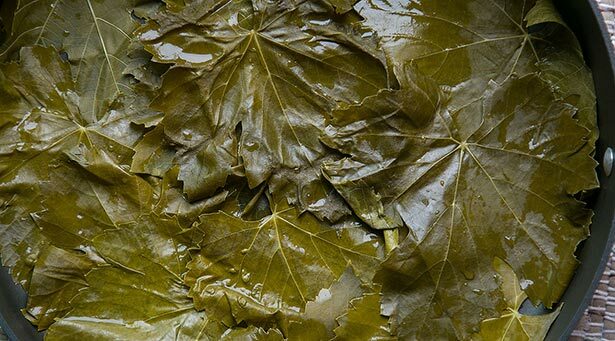 Use ripped or small grape leaves to line a wide pan; this will prevent dolmades from sticking. In a pot, bring water to a medium boil and blanch larger grape leaves for 5 minutes, in batches. Remove leaves from water and transfer to a colander to dry. 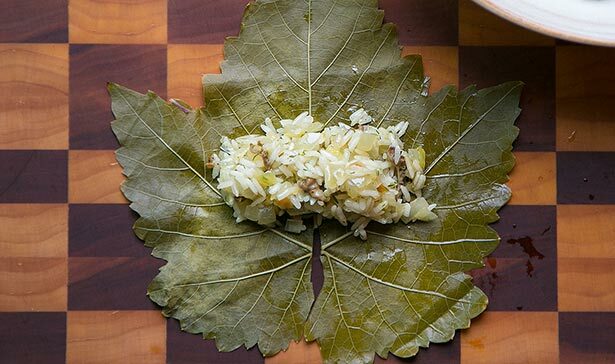 Lay the rolled dolmades, seam-side down, into the pan lined with grape leaves. Pour the rest of the chicken broth over the dolmades along with juice of 1 lemon, ¼ cup of olive oil, salt and pepper. Liquid should come up halfway on dolmades, and if not, add more broth or water. 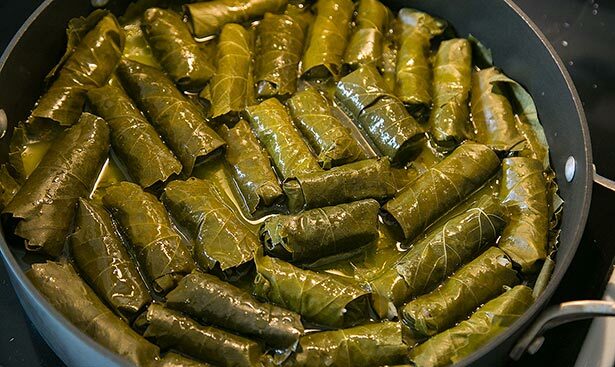 To keep rolls intact, lay a plate directly on top of the dolmades to weigh them down. Then cover the pan and simmer on low for 45 minutes or until the grape leaves are tender and can be easily pierced with a fork. Serve at room temperature or cold. (Don’t reheat them in a microwave because the grape leaves will become chewy.) You can serve dolmades by themselves or with a Greek yogurt sauce.